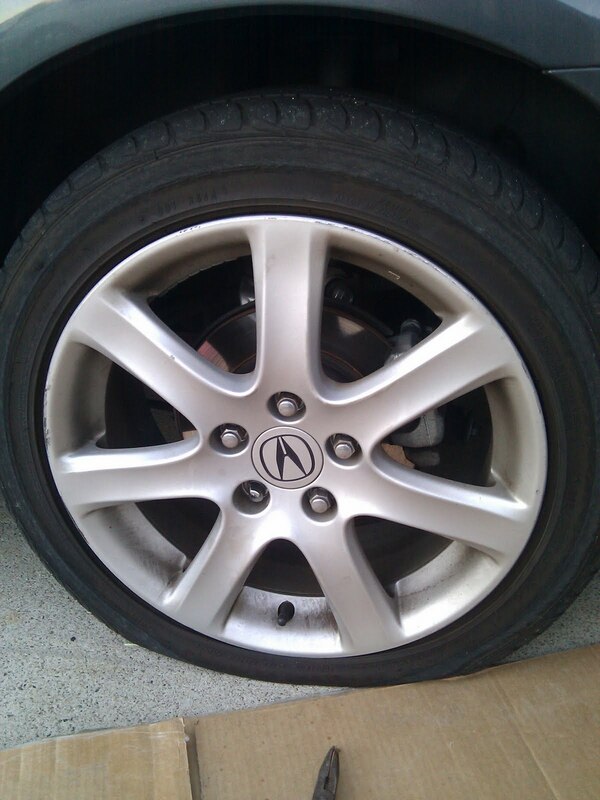 AboutAcura: My Acura Wheel Lock Lug Broke! Oh boy, my year has been off to an unlucky start. On my way to lunch, I noticed my Acura TSX was pulling weird. My coworker and I hopped out of my car when we arrived at our destination and found that my driver side rear tire was flat due to a nail. I thought that it wasn't a big deal and that I will change the tire later at my work's parking lot when the sun went down a little bit, then take it to Discount Tires. So around 3pm I went down to the parking and pulled all the equipment and spare tire out of my trunk to change my flat. I popped on the wheel lock key and started to loosen the wheel lock. That lug was on pretty tight so I stepped on the tire iron then all of a sudden SNAP! I thought to myself what just happened? When I looked down I saw bits of metal on the pavement. Crap I thought! I tried to use the key lock to see if I can get the rest of the lug that is stuck on my car off, however that did not work. So I ended up calling the Acura dealership that I take my car to sometimes and had a conversation with one of the service manager. He said if it was the key that broke that was easy and to come by and borrow the key, however if it was the lug then tow it to them where they can take a look at it for $150/hr. I told him, "No thanks." 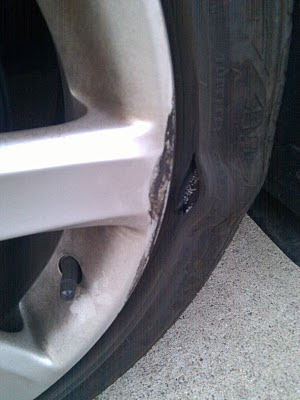 Rear driver side tire flat due to nail; notice broken wheel lock lug. My friend told me to drive my car to his place and he will try to cut the rest of the lug off. So I left work early and drive 5 miles with a flat to his house where we struggled for about an hour with not much success. While at it, we notice my front driver side tire was splitting and was able to explode. I was like "Jeez... How did it go from a flat because of a nail to a broken wheel lug to another tire needing replacement?" I assumed it was from hitting a pothole and confirmed later by Discount Tires. Front tire about to explode; damaged because of pothole. It was then I we decided to quit trying to cut of the rest of the lug and just tow my car to my mechanic's shop, but since it was late I would have to just leave my car there and come back in the morning and tell him what's going on. I need to remind myself to sign up for AAA because my tow cost me $65 and a 2 hour wait. Close up of broken wheel lock lug. In the morning, I showed my mechanic what's up. He looked for a special spiral socket and spent 20 or so minutes struggling with trying to wrench it off and then trying to cut the lug off. He was finally able to use an impact gun to torque it off with the special socket which he had to hammer in. He didn't charge me anything and just told me to get my car over to Discount Tires and get it taken care of. 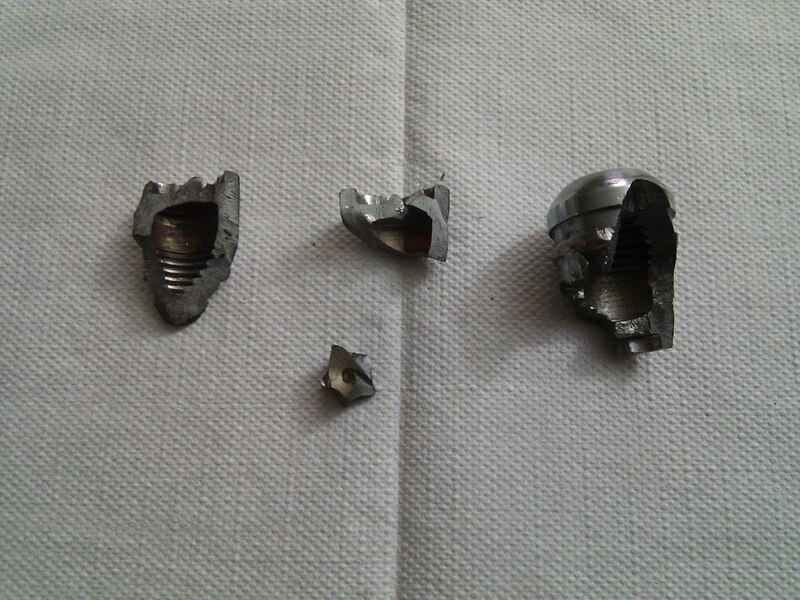 Broke lug finally off and the bits that broke off. 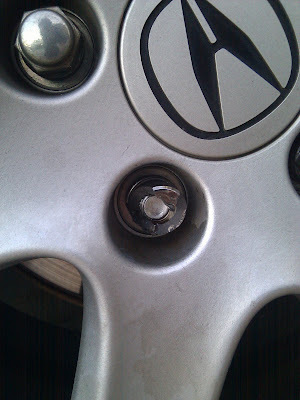 Anyone else ever had experience with an Acura wheel lock lug disintegrate on them? I feel like Acura should reimburse part of my repair cost or at least give me a set of new wheel locks.